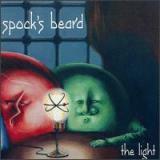 Ahhh, Spock’s Beard – The finest in progressive rock that the state of California (or even the United States) has produced to my ears. Put together in 1992 by the Morse brothers Neil and Alan and joined soon by drummer Nick D’Virgilio and bass player Dave Meros, the Beard started their recording career the independent route. This album, their debut, was recorded and released largely with money provided by A. Morse himself, which logically meant that the band had a totally free reign on the musical elements on the record. This leads to The Light being at the same time all out there, zany, beautiful, crazy and in one word, versatile. Clocking in at almost an hour despite only containing four songs, this album holds itself up very admirably in the face of proggy epics of lore. The title track, divided into eight sections begins with a very subtle piano passage, leading into a groovy, rocking riffage. The tune goes from complex hard rock to flamenco interludes to full-blown symphonic rock mode with keyboards growing huge, especially considering the modest circumstances in the production and financing of the record. Neil Morse’s soaring voice shines throughout, even in the rougher sections where he pulls off some menacing tones, aided by some tinkering with distortion effects. Overall, the song is much like the titles of its first and last parts indicate – Like going through a 15-minute long dream. Go The Way You Go “kicks back” a little by only going twelve minutes, mixing up hard rock and Beatlesesque pop with proggy rhythm changes and jazzy interludes. Some of the spacier keyboards ooze of 70’s Rush while the duelling of the guitar and keyboards are much more reminiscent of 80s metal. Among the giants, the biggest one on the album is undoubtedly The Water, going from Pink Floydian balladry to almost punkish, angry rocking within 23 minutes. I won’t even try to point out different sections musically, the whole thing is just too awesome. Lyrically, the song is very, very interesting especially to listen to today, with Neal Morse off doing his solo thing after becoming a born-again christian. The song seems to largely be a meditation on faith and let’s just say that there are parts in there that I doubt he is singing live anymore, if not to prove a point of just how much people’s views can change. Whether you’re into a religion-based theme or not, the song should knock you out of this world anyhoo. Interestingly enough, the 6-minute On The Edge has been chosen to close the record. Usually the most grandiose pieces are the closers on albums, but the Beard reversed it. On The Edge is logically the most straightforward tune in the bunch – just a hard rock blast with some excellent switches in tempo among the mostly steady-rolling verses. Bass work rules here. While standing out from the earlier three tracks, it’s so, so good. If you’re wondering does the record have guitar solos to spare, harmonized vocals and all that good stuff, fear not. Like their big influencer Genesis, the band quickly shows that they have a similarly brilliant duo of voices in Neal Morse and Nick D’Virgilio. When ever they “duke it out” on the mic, the results are magnificent. The precise reader caught on to the namedropping prevalent in this review. While the band members weren’t extremely young in comparison when the album came out, their influences still shined through very strong. They would define their own style much, much further on releases like The Kindness Of Strangers, Day For Night and Snow. Still, as a debut offering, The Light is absolutely stunning stuff. Many fans still consider it their best album to date, which is understandable when thinking about the abundant melodic bursts mixed in with the sometimes completely reckless musical abandon. It’s not the most refined work out there, but if you want a prog album that I’d call being “in your face”, go to The Light.